Internal parasites are an epidemic, affecting as many as 20% of dogs and even more cats. Some of these parasites even pose a threat to humans. 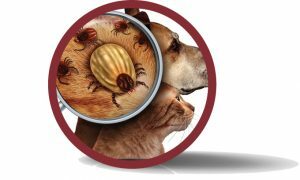 Because of this, the AVMA, the Companion Animal Parasite Council, AAHA, and may others recommend monthly, year-round parasite control for dogs and cats. To protect your furry friend, your family, and your yard Skyline supports that recommendation 100%.